Have you ever wanted to just randomly throw tomatoes at people just for fun? 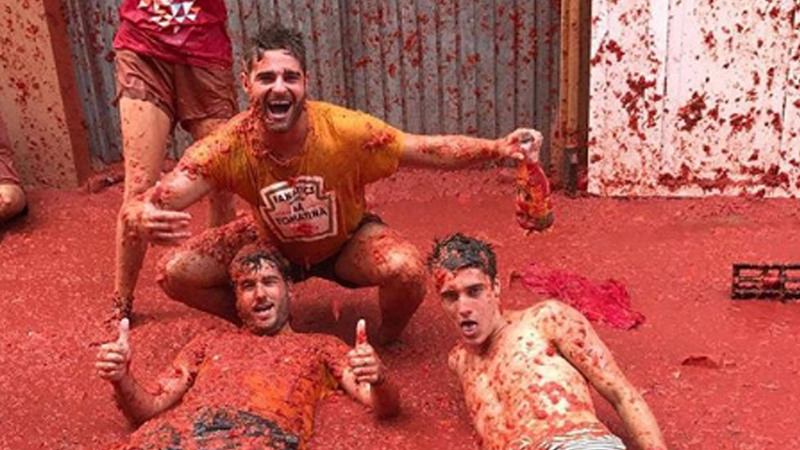 In a festival annually held at Valencia (Buñol) every end of August, this “bloody” and crazy festival allows everyone to throw tomatoes at other people. This tomato war is called La Tomatina Festival wherein hundreds of tomatoes are brought by few small trucks inside the town. Once the tomatoes are already dropped on the ground, people start to join and pick-up pieces of tomatoes to throw at their friends, neighbors, colleagues, and even strangers. Expect an all-red town after the tomato war because it lasts for about an hour. Luckily, there are water trucks located at the festival ready to splash the people with water and hose down the streets so they get cleaned. Some participants also go to the “Los Peñones” pool to wash.
To maintain discipline while having fun, the city council observes few rules for the participants’ safety. These include prohibiting participants to throw bottles or hard objects and tearing or throwing other’s shirts as well as requiring the participants to squash the tomatoes before throwing, keep a safe distance from trucks, and follow directions of security staff. Bloody but yummy isn’t it?